The Bunker Hill Flag is a popular American Revolution flag that some believe was flown at the Battle of Bunker Hill at the outbreak of the war during the Siege of Boston. The flag is an English Blue Ensign with a St. George's Cross in the corner with a pine tree, which represented liberty to the colonists. Many historians believe the Bunker Hill Flag was not actually flown at Bunker Hill, but was the result of a printing mistake in a flag book years after the war. 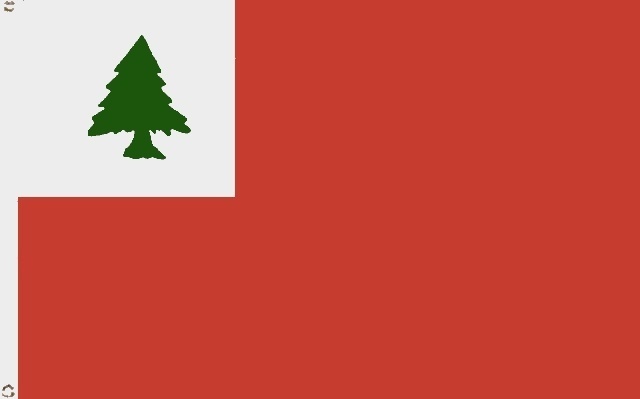 Most believe if there was any flag flown at Bunker Hill, it was a red flag with a simple pine tree in the corner. The Bunker Hill Flag is said to have flown at the Battle of Bunker Hill early in the American Revolution. It features a dark blue flag with the English St. George's Cross in the canton (the upper left corner), as well as a pine tree in the upper left quarter of the canton. St. George was the patron saint of England and his flag was used as the English flag since the time of King Henry VIII. The Battle of Bunker Hill was fought on June 17, 1775. The colonists' militia groups had been camping around Boston since the outbreak of hostilities at Lexington and Concord on April 19. Now they were surrounding Boston in an effort to keep the British confined to the city. Breed's Hill and Bunker Hill lay on another promontory north of Boston, along with the city of Charlestown. This was called Charlestown Peninsula and it was also connected to the mainland by a narrow neck of land. On the evening before the 17th, the colonists stealthily sent 1200 men to occupy Breed's Hill, which was closer to Boston. Bunker Hill lie behind it and was used for reserve troops. In the morning, British General Thomas Gage discovered what the colonists had done during the night and immediately began to assemble his troops to confront them. More than 1500 Redcoats rowed a short distance across Boston Harbor to land on the peninsula. This is the same route that Paul Revere rowed on the evening of April 18th to warn Lexington and Concord that the British were coming. More about Paul Revere's ride here. The British made two assaults on the colonists on Breed's Hill, losing a great many soldiers, but were driven back each time. Eventually reinforcements came to aid both sides and the numbers on each side were doubled. A third effort by the British to take Breed's Hill was successful because the colonists ran out of ammunition and were forced to flee. Many were shot down on Bunker Hill as they fled. The Battle turned out to be a devastating one, especially for the British, who had 226 killed and 828 wounded. The colonists lost 115 men, with 305 wounded and 30 captured. It was a blow to the British in troops, as well as in pride. The colonists were grieved at the loss of their friends and family members, but they proved to themselves and the world that they could stand up and fight for themselves against the largest army in the world. There are no contemporary accounts placing this particular flag at the Battle of Bunker Hill. After battles of the Revolution, both the English and the American authorities would take extensive depositions from participants to find out exactly what happened. Those who fought would write about the details in diaries and letters. There is not a single account of this particular flag being flown. An officer of the Royal Marines reported that no flags were flown by the colonists. 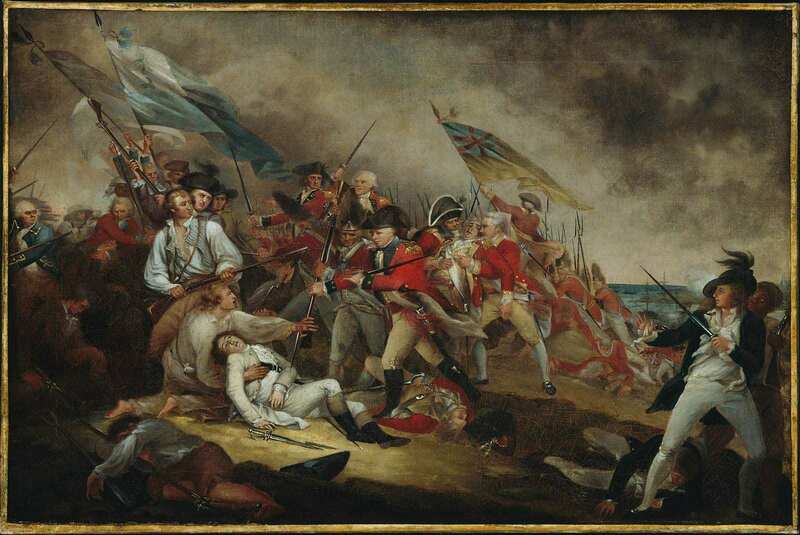 Jonathan Trumbull, a famous Revolutionary War artist painted a picture of the battle called The Death of General Warren at the Battle of Bunker Hill, so named due to the death of patriot hero Joseph Warren at the battle. Trumbull was known for making great efforts to paint with historical accuracy. He also was an eyewitness to the battle, observing it through a telescope. Trumbull was known for making detailed maps of the military positions around Boston and later was made an aide to General Washington. He showed the colonists carrying an English Red Ensign with a pine tree on a white field in the canton (the upper left corner). 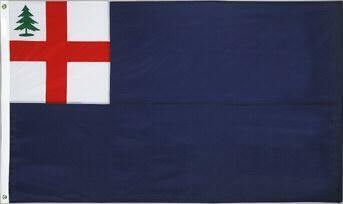 This became known as a Continental Flag and was a commonly used flag in New England. This has led some to believe the colonists must have been carrying this flag, which is also known as a New England Flag, but the same picture shows the British carrying a flag with a St. Andrew's cross on a red field and no such flag ever existed. So Trumbull may have been drawing flags of fancy. The Bunker Hill Flag as we know it today exactly matches the traditional English Blue Ensign, which was a blue flag with the St. George's cross in the canton, but with a pine tree added in the corner. In actuality, colonists are known to have flown this flag, but with a red background, not blue, the red flag being the more common color in colonial shipping. The same flag with a red background, is known as an English Red Ensign. You can read more about the development of British and American flags at our British Red Ensign Flag page. The only account ever recorded that actually places the Bunker Hill Flag at Bunker Hill was given by author Benson John Lossing who wrote in his book Pictorial Field Book of the Revolution, that he had interviewed the daughter of a Bunker Hill veteran who told him her father told her he had lifted a blue flag at Breed's Hill prior to the battle. This book was not published until the 1850s and obviously the daughter was speaking from memory. Her father would have died much earlier. If this account is true, it only verifies the flying of a blue flag at Bunker Hill, but gives no description of the emblem in the canton. None of these sources give very reliable evidence to make a firm decision that the Bunker Hill Flag was indeed there. Instead, a more logical conclusion is usually favored by historians. Historians believe a book publisher in the early 1800s was making a book on early American flags. The wording of the book was correct, describing the Continental Flag, used by colonists at Bunker Hill, with a pine tree, a St. George's cross and a red field. But when the book was given to the artist for hand coloring, he allegedly colored the flag the wrong color, using blue, instead of red. The error wasn't noticed or if was, it wasn't corrected. The book had wide distribution and readers didn't know any better, so the idea simply took hold in people's minds and has remained ever since. Whether it is historically accurate or not, the blue Bunker Hill Flag has come to signify American independence and the Revolutionary War. 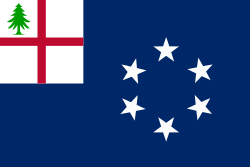 In 1988, the New England Governor's Conference adopted a flag to commemorate New England's history. The flag is the Bunker Hill Flag with a circle of six five-pointed stars in the middle of the blue field to represent the six states in New England. The flag was designed by artist Albert Ebinger. The Bunker Hill Flag was also featured on a 1968 US Postage Stamp. Order your own Bunker Hill Flag and help support this website with your purchase.